Fri 21:0230 Action Stations. 0630 commenced landings San Carlos Bay. No opposition until after sunrise 1130 – several air raids, Mirage 5’s – Ardent sunk – Argonaut 2 x UXB’s, 2 dead – Antrim UXB (later diffused) – Brilliant attacked. Frightening moment when 2 x Mirage’s came straight for us but did not fire! Our D-Day finally arrived; we went to action stations at 2.30AM as we approached San Carlos Water, a large fjord like inlet to the North West corner of East Falkland. The previous week’s weather had been good to us in the respect of providing perfect cover under heavy cloud and almost constant rain in near gale force conditions, although the Argies undoubtedly knew we were there they had no idea in what numbers and what was actually going on. As a result, they had no idea just where or when we were going to attack. Intelligence told us that there was an Argentine observation post set up on Fanning Head, at the entrance to San Carlos Water, so while we were marshalling our armada of amphibious landing ship and Merchant Men right under their noses, HMS Antrim kept them busy by firing 4.5 inch shells close to their location while a team of SBS Marines were making their way up to dissuade them from reporting our activities! In general the entry to San Carlos went to plan and troops began to get ashore. Things were pretty quiet until dawn at around 11.30AM - The Task Force was operating in GMT to remain in line with London and our controllers in Whitehall, at the Ministry Of Defence, which had the added benefit of us starting our day 4 hours before the Argies, which inevitably meant we would catch them out at times they weren’t expecting and early morning bombardments would really disrupt their sleep – But with dawn came a lone Puccara Argentine reconnaissance aircraft flying low over the hill tops and across the sound, straffing ships with cannon fire, which was met by gunfire of all kinds from every ship and soldier in sight. He didn’t hang around long but our cover had been blown, the next five hours saw wave after wave of A4 Skyhawks and Mirage V’s make low level bombing runs and peppering the ships with cannon fire. The noise was incredible as Plymouth alone responded with her 4.5” main armament, Seacat Missiles, 20mm Anti-Aircraft Guns as well as sub machine gun fire from the upper deck amongst similar responses from the assembled ships. These air raids took their toll on a number of our ships. 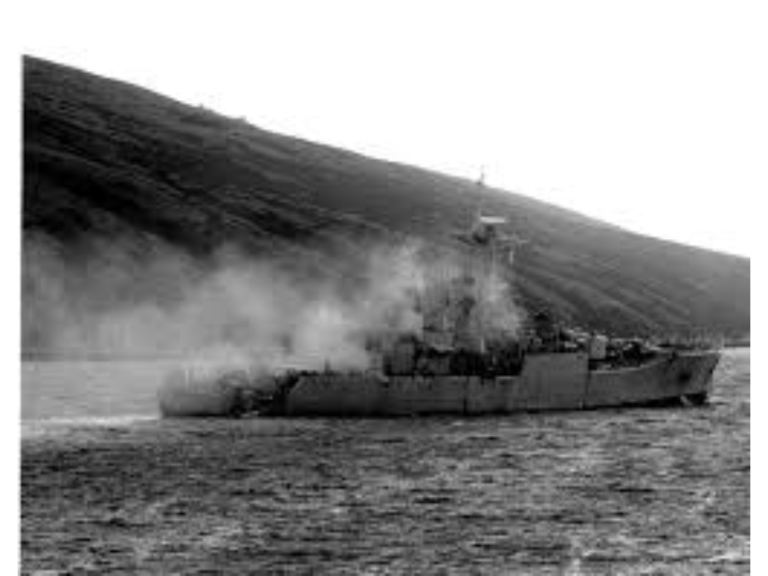 Under heavy attack in Falkland Sound, the channel between the two islands HMS Ardent and Brilliant had been ‘bounced’ by several A4’s and a huge explosion was seen on the flight deck of HMS Ardent which sealed her fate, she later had to be abandoned and sunk the following day, leaving just 3 feet of mast and 2 liferafts betraying her position. HMS Antrim was hit and an unexploded 1000lb bomb was later diffused by bomb disposal officers. HMS Brilliant was hit by rocket fire and HMS Argonaut by rocket fire and two unexploded bombs in her Seacat Missile Magazine. Argonaut’s story was particularly poignant for me as two men died on-board as a result of them being in the Seacat magazine when the bombs came in. It wasn’t the bombs that killed them but the fact that something had been detonated during the impact, not the bombs though and smoke was detected inside the magazine. It would have put the rest of the ship at risk of fatal explosion had the hatch been opened to investigate and a very quick decision had to be taken to flood the magazine, to save the ship and the rest of the ships company from massive loss of life. The two sailors were drowned in the magazine and a young officer whom I had known at Dartmouth had been involved in making the decision. I can’t imagine how he must have felt afterwards and vented my own frustration on a sailor on-board Plymouth when I heard him bad mouthing that officer for not getting them out before flooding!